One week after the bill H.R. 6162 Coin Modernization, Oversight, and Continuity Act of 2010 was introduced, it has been passed in the House of Representatives. The bill provides for a number of measures related to U.S. circulating coins and bullion. The majority of the bill involves increasing Congressional oversight of circulating coin production. The Secretary of the Treasury would be required to provide a biennial report to Congress on the costs and cost trends of circulating coins. The Secretary would also be able to make recommendations about changes to coin compositions based on “research and development” activities performed. The Director of the United States Mint had previously advocated delegating full authority to the Secretary to select coin compositions, but under the bill, Congress would retain this authority. The bill also seeks amendments to the law behind American Gold and Silver Eagles. The amendments would be to allow the Secretary of the Treasury with the ability to strike coins in both “qualities and quantities” necessary to meet public demand. The motivation for the change would be to ensure that proof versions of the coins may be struck for collectors, even at times of high demand for the bullion versions of the coin. Finally, the bill would make amendments to the law behind America the Beautiful Silver bullion coins. 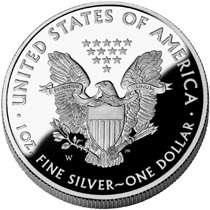 These five ounce .999 fine silver coins are currently required to carry designs that are “duplicates” of the quarter dollars, have a diameter of 3.0 inches, and include incuse edge lettering. The amendments would require the coins to be “likenesses” of the quarter designs, with a diameter between 2.5 and 3.0 inches, and eliminate the requirement for edge lettering. In order to become law, H.R. 6162 must still be passed in the Senate, and then signed into law by the President.